In need of Amsterdam information for travel purposes? Also see our pages with background information on Amsterdam and remarkable Amsterdam facts. Since Amsterdam Schiphol Airport is a major European hub, Amsterdam has excellent air connections to just about everywhere. There are good international railway connections to Brussels (Belgium), Cologne (Germany) and Osnabrück (Germany), and from there to about anywhere in Europe, including London through the Calais-Dover tunnel. When traveling to Amsterdam information on visas is important to have. Nationals from (among others) the following countries do not need a visa: USA, UK, Canada, all EU and EEA countries, and Switzerland. More information is on the Dutch Foreign Ministry site: https://www.government.nl/topics/visa-for-the-netherlands-and-the-caribbean-parts-of-the-kingdom. You also need a passport that's valid for 6 months after your arrival, a return ticket and funds deemed enough for your stay. Other nationals should check the latest visa rules with the Dutch government. Like many other European countries, the Netherlands uses the Euro. Foreign currencies are usually not accepted. Amsterdam is still a cash society. However, these days you can pay almost everywhere with debit cards that use the Maestro, Cirrus or Plus system. You do need your PIN code for that. Credit cards (VISA and MasterCard) are accepted in many restaurants and hotels, but many shops, cafés, museums etc. still don't. However, you can get Euros from the many ATMs in the city with a debit or credit card that uses the Maestro or Cirrus system. Exchanging foreign currency is best done at GWK offices (there's one at the Central Station). 'Verkoop' means sell, 'Koop' means buy. Hotels change money too, but they charge higher commissions. Travelers Cheques are not as widely accepted as in many other cities. Tipping isn't quite the routine it is in the USA or UK, but adding 5 to 10% to your bill in restaurants, cafes and taxis is appropriate in case of good service. Amsterdam has excellent and inexpensive public transportation (especially trams and the subway). Bicycle rental may even be a better idea: it's cheap, typically Dutch and since the city centre is small it's the quickest way to get from A to B. Since traffic is often stuck and parking space is expensive, a car is pretty useless in Amsterdam. Taxis are plenty available but expensive. Amsterdam is in CET (Central European Time), meaning one hour later than London, 6 hours later than New York, 4 hours earlier than Delhi and 9 hours earlier than Canberra. Amsterdam (like the rest of the Netherlands and Europe) uses the GSM 800 / 1800 system. If you have a phone that works with any of these, your phone will probably switch over to a Dutch network automatically the minute you arrive in Amsterdam. Since the USA and Canada use the GSM 1900 system, most North American cell phones don't work in Amsterdam, unless it's a triband or quadband phone. If you must have cell phone connectivity in the Netherlands and you don't have a cell phone that works with the GSM 800 or 1800 system, consider buying a cheap phone, or rent one. Buying a sim-lock-free cell phone in the Netherlands is possible from 50 euros upward. The Netherlands use the 220-240 Volt (50 Mhz) system that's common everywhere in Europe, Australia, Asia and Africa. But since electricity plugs often still differ, visitors from some countries (e.g. the UK, Australia, Switzerland, Ireland) need to bring a plug adaptor. However, the USA, Canada and a part of South America use 110-127 Volt, so besides a plug adaptor you also need to bring a transformator. Some gear (e.g. chargers for mobile phones or camera batteries) also works without a transformator, but check this carefully in advance. Amsterdam's phone prefix is 020, but the above numbers are national phone numbers. 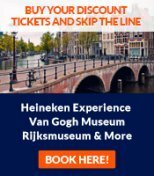 Are you missing any Amsterdam information on this page? Please let us know.